MetLife Learning for Life uses the essential learning and life skills inherent in the arts as an engaging, life-long learning model to promote creativity, critical thinking, cultural awareness, and communication across all subject areas, including STEM (science, technology, engineering and math) and literacy. 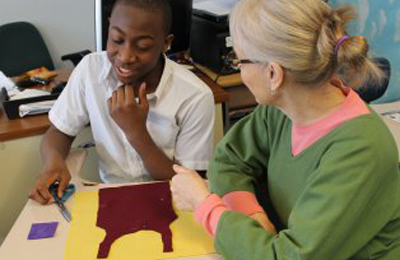 The program, which focuses specifically on middle school students, is comprised of in-depth creative problem-solving residencies led by YA teaching artists in close partnership with classroom teachers and supported by intensive professional development. In the 2012-2013 school year, YA focused on sustaining and deepening the work by providing awards to 13 YA affiliates: Connecticut, Pittsburg, Houston, Louisiana, Massachusetts, Miami, Northeast Texas, New Jersey, Ohio, Rochester, San Diego, Denver, and Western New York. In total, Learning for Life residencies reached over 2,424 students in 145 classrooms in 28 schools nationwide. Each participating affiliate was asked to create a case study of their MetLife Learning for Life residency. Below are select case study highlights from around the network, click through to view the entire case study. Can self-esteem, school performance, and positive life choices of at-risk middle school students be influenced by their participation in an after-school dance program? Wherjagethatshirt? Exploring environmental, political and business issues embedded in a favorite garment. How can middle school students use the arts to transform knowledge and be empowered to act as educators for younger generations?